With sweeping views across to the city of Los Angeles, and exclusive use of the entire mansion, the West Hills Private Estate is a one-stop wedding day destination for couples and their closest family and friends. 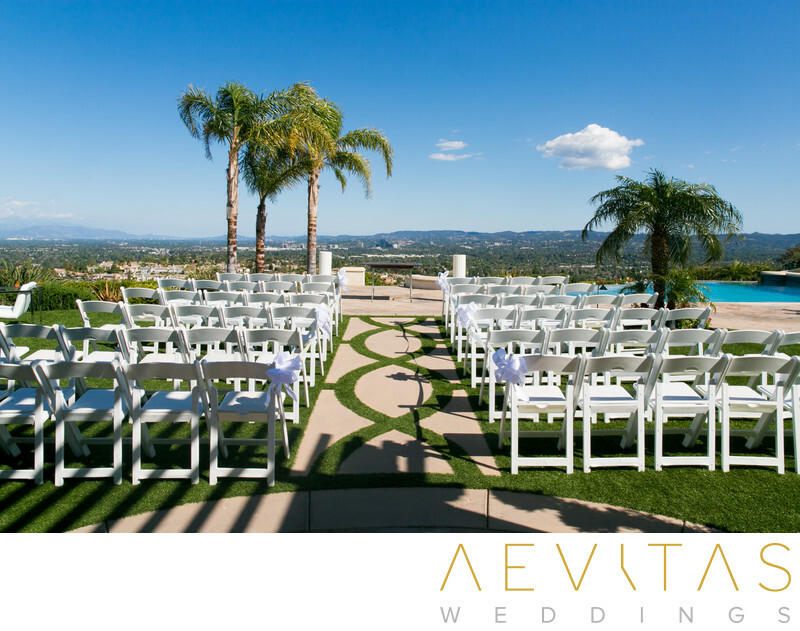 Its proximity to Los Angeles makes it logistically easy for your wedding guests to access, while bridal suites and rooms mean that you can extend your wedding day celebrations into an entire weekend. After getting ready for your special day in one of their upstairs suites, you can opt for a first look session in one of the elegant hallways or shaded outdoor spaces. Then prepare to say “I do” on their expansive, pool-side back lawns, overlooking the cityscape that lies beyond. While your wedding guests are busy enjoying cocktail hour, the West Hills Private Estate staff will perform a “flip”, transforming the ceremony space into a romantic, al fresco reception venue. Wine and dine under the stars, with the twinkling lights of LA in the distance, then let the party get started on the interior dance floor, with no noise restrictions cutting the night short! Wedding parties of 150+ can easily be accommodated, with exclusive use of all facilities throughout the event. It is ideal for weddings that include families and kids, with the pool or board games to keep them entertained and quiet spaces for those who need to retire early. The West Hills Private Estate is like a blank canvas for couples to decorate just the way the want, and we highly recommend you invest in the services of a wedding planner to help execute the day as smoothly and stress-free as possible. From managing catering and outside vendors, to all the setup and breakdown logistics, the role of a wedding planner in a West Hills Private Estate wedding will ensure you can just relax and enjoy it to the full.